Learn from champions Nicky Haslam and Robert Winter. With easy to follow instructions and detailed explanation of the moves and techniques, you can have fun learning 16 of the most popular Beginner Modern Jive moves at your own pace. 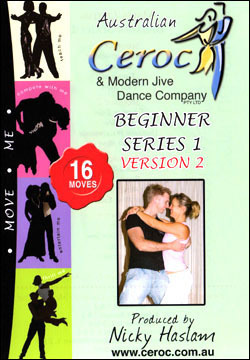 This original and professional instructional DVD is designed, performed and presented by Nicky Haslam, Founder of Ceroc in Australia and five times Australasian Champion, partnered by Robert Winter, Australasian Open Ceroc Champion. Together Nicky & Robert are UK Jive Masters Champions. PLUS: There is an in-depth tips section covering all the essential techniques in detail so that you learn it "right" first time and get dancing better and quicker than ever.